Well, good evening, good to be back again to share God's word. We're turning tonight to John 13 and, if you can remember, we finished just short of the end of the chapter, and that was on purpose because we're going to look tonight at verses 36 of John 13 right through to chapter 14 verse 6. Now, I was allocated these portions as usual and tonight was emphasised as being an evangelistic evening. Now I know that hasn't, perhaps, been announced or emphasised, so there will be both teaching and gospel in this message, and encouragement hopefully, and it will fit very well, actually, with what we were looking at this morning from John chapter 11, 'I am the resurrection and the life'. I'm taking as my title tonight: 'The Cure For Care'. So we will begin reading, please, at John 13:36: "Simon Peter said to Him, 'Lord, where are You going?'. Jesus answered him, 'Where I am going you cannot follow Me now, but you shall follow Me afterward'". Now let me just pause there, because I mentioned this morning in passing a revival in an old untruth, heresy, which is very like 'soul sleep' - but is even worse, as far as I can see, because it is purporting that the soul doesn't sleep, it actually ceases to exist. 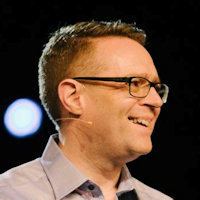 What these teachers are now doing in mainline evangelicalism, some of them, are telling us that there is no intermediate heaven - that when you die, you just cease to exist, and that the resurrection, that's what we all ought to look forward to (we ought to look forward to that, and I think often we don't emphasise resurrection as we ought), but it's not until then that you will live again and be 'recreated' in effect. Now there's a problem right through the Scriptures if you take that particular viewpoint - very clear passages, some of which we will touch on tonight, not in relation to that of course but they will be very relevant. This is a very interesting one in the light of what I have just shared of this particular heresy, Jesus says: 'Where I am going you cannot follow Me now, Peter, but you shall follow Me afterward'. Now the 'you' here is the second person, which means it is directly pointed at Peter. It is an inference to Peter's death in martyrdom, that he would follow Jesus in death for Jesus. He would not follow Jesus as Jesus was going to the cross, and then eventually through resurrection to heaven, at that moment - but he would, not long after. So he was following Jesus, even before resurrection. Let's read on, verse 37: "Peter said to Him, 'Lord, why can I not follow You now? I will lay down my life for Your sake'. Jesus answered him, 'Will you lay down your life for My sake? Most assuredly, I say to you, the rooster shall not crow till you have denied Me three times. Let not your heart be troubled; you believe in God, believe also in Me. In My Father's house are many mansions; if it were not so, I would have told you. I go to prepare a place for you. And if I go and prepare a place for you, I will come again and receive you to Myself; that where I am, there you may be also. And where I go you know, and the way you know'. Thomas said to Him, 'Lord, we do not know where You are going, and how can we know the way?'. Jesus said to him, 'I am the way, the truth, and the life. No one comes to the Father except through Me'". Let us pray, and let us all together pray that God will come and meet with us, and speak to many hearts here this evening. Father, we thank You for Your word. We thank You for the power of the Gospel, we thank You for the Holy Spirit who has been given to the church, and we thank You, Lord, for any evidences we have of His ministry amongst us. We pray for that afresh tonight, that the Holy Spirit would come and take the Word and apply it to our minds and our hearts, that our very spirits would be touched with the quickening power of the Holy Spirit taking the Word of God and applying it to our lives. We pray tonight that it might please You to come, and to illumine those who are still dead in their trespasses and in their sins, people who are weighed down with sins, burdened with their lives. Lord, we pray for believers who also feel heavy laden. O God, so many cares and concerns that, at times, destroy the peace and joy that we ought to have in our Lord. So we pray tonight that You will minister to them too, and all of us together that we might be encouraged as we contemplate these great eternal truths. So Lord, hear us we ask, for we ask alone for the glory of our Lord Jesus, and we ask for the help of the Holy Spirit now. In Jesus' name, Amen. Most of the chapter divisions in Scripture are helpful, but occasionally they obscure something that God perhaps has intended us to see. Therefore we can fail at times to connect two chapters in their theme because of a man-made division, when God may well desire that we should read them flowing seamlessly. Now I do believe that here is one such instance, between the end of chapter 13 and chapter 14 - that's what we've read together. So just look at it, taking the last verse of chapter 13 and the first verse of chapter 14: 'Jesus answered Peter, 'Will you lay down your life for My sake? Most assuredly, I say to you, the rooster shall not crow till you have denied Me three times. Let not your heart be troubled; you believe in God, believe also in Me'. Now, of course, the 'Let not your heart be troubled' is in the plural, He's addressing all of the disciples - but there is a truth here that I believe has often been obscured by a division of chapter 13 through to 14, and it is this: Peter, on the brink of denial, predicted by the Lord Jesus Christ how he would deny Him vehemently, we know, with oaths and curses; the next breath that comes from our Saviour is, 'Peter, don't worry'. Is that not precious? 'You believe in God, believe also in Me'. We know from the other gospel records that He gave other reassurances to Peter that Satan desired that he would sift him like wheat, but 'Peter, I have prayed for you, that your faith fail not' - but imagine, I mean, what would we do in such circumstances? I mean, if someone who we knew was about to sin grievously, how would we treat them? You see the grace of our Lord Jesus Christ, what grace! 'Peter, you're going to deny Me, but don't be troubled!'. Of course, in verse 37 Peter felt that he would have died for Jesus right then - but later we find that his devotion was only based on emotion. There is a profound truth there, because - by the way, emotion is not sinful, sometimes you'd think, in certain Christian circles, that there was something evil about emotions. Emotions are vital to the Christian walk, but emotions cannot be our power, nor our foundation for our faith. They are very fickle, emotions, they've got to be regulated by other more superior principles: truth, faith in the truth, and then the emotions will come into line. But Peter made this statement: 'I will go even to die with You, Lord', based on his emotions - but when his circumstances changed, his words changed. We must beware ourselves of what we say we would do in any given situation, if we are not presently in such a situation. Do you understand what I'm saying? Well, let me illustrate it to you: sometimes you say, 'Well, if I was him', or 'If I was her, that's what I would do' - is it? Are you sure about that? Even in relation to God, we can contemplate what we might do in any given situation - but Scripture warns us to be very careful what we might say in an emotional moment. Sometimes we have to be careful, even in gatherings where we're being called upon to make commitments - and, of course, I'm all for that, put all the pressure on that you can biblically and in the Spirit for people to make commitments, but we've got to make sure that they're not based on mere emotion. The preacher said in Ecclesiastes: 'Do not be rash with your mouth, and let not your heart utter anything hastily before God. For God is in heaven, and you on earth; therefore let your words be few. When you make a vow to God, do not delay to pay it; for He has no pleasure in fools. Pay what you have vowed; better not to vow than to vow and not pay'. Peter didn't know his own heart, and sometimes we don't either. We say we would do this or that in certain situations, or 'I'm going to do this for God'. It's good to have ambition for God, but we've got to make sure it's based on the right foundation, not merely on emotions but on a surrendered will. When we come into the Acts of the Apostles, we see a different Peter - a Peter who is no longer building his decisions on emotion, but building his Christian life upon the finished work of Christ, the resurrection, and the gift of the Holy Spirit at Pentecost. That's what turned Peter into the humble dynamo - that's what he is. Beforehand he's all courageous and bold, but when it comes to the moment he is weak and fickle - but then we see, after Pentecost, he becomes humble and yet in the same instance he becomes bold and courageous! Interesting, isn't it? It's no wonder that the disciples were troubled - as I said, the 'you' is in plural here in chapter 14. Here's why they were troubled: one of them would betray the Lord, we saw that last week. Then they have just heard the Lord directing Peter personally, predicting that he would deny the Lord. So one of them is going to betray the Lord, one of them is going to deny the Lord, and I'm sure when the others heard that Peter - you know, big, courageous, bold Peter - was going to deny the Lord, they started to doubt themselves and thought: 'Well, if Peter is going to deny the Lord, what hope is there for the rest of us staying true and faithful?'. They were troubled. But no doubt the biggest shock was Jesus telling them: 'I'm going away'. In verse 33 of chapter 13 He said: 'Little children, I shall be with you a little while longer. You will seek Me; and as I said to the Jews, 'Where I am going, you cannot come''. What a shock! Where is He going? Can we not go with Him? How can we get to where He is going? They were so troubled! You know, trouble and care, whatever label you wish to put on it, anxiety, worry, fear, phobias of all sorts, there are many psychiatric labels put on many symptoms that don't really get to the heart of the problems - but ultimately our world, with all the helps that we have, mod cons and technological advances, we are a society completely weighed down by care. If ever there was one, it is ours. Trouble on every hand. Now, what did Jesus share with them to cure their care? Well, there is twofold truth here. The first thing is: Jesus encouraged them by telling them, first of all about Himself, and about the Father. The second thing He did was: He then gave them the hope of heaven. First of all He tells them about Himself and the Father, and that's very interesting because the Lord knows the medicine that you need for your condition. Whenever you're in trouble, the thing that you need the most is a good dose of personal knowledge of the Father and of the Son. Now, if any of us are weighed down with care, or any sort of problem or crisis, and we come to some kind of spiritual physician or counsellor, the last thing we expect them to write on their prescription, proverbially speaking, is: 'You need to learn more about the Father and the Son'. You wouldn't expect that, would you? You'd want some technique of some sort, some spiritual tranquilliser bottle to take, a shot in the arm - the first thing the Lord does is He tells them: 'You need a dose of the knowledge of the Father and the Son'. Now that correlates with Isaiah 26:3: 'You will keep him in perfect peace, whose mind is stayed on Him, because he trusts in God'. I came across a wonderful quote this week by Corrie Ten Boom, she said: 'If you look to the world, you'll be distressed. If you look within, you'll be depressed. If you look at God, you'll be at rest'. You might think it's simplistic, but there is a great profundity in the simplicity, let me tell you, because I know about it. When we get our eyes fixed on God and His great attributes, and His Son Jesus in whom all of His character and nature is perfectly revealed, when we get our eyes upon Him it somehow lifts us out of ourselves and our situations. That's the first thing the Lord did: 'You believe in God, don't let your heart be troubled. If you believe in God, believe also in Me'. The second thing He did was, He gave them the precious promise of heaven and His return for His own people. That's something we now can lay hold of by faith, it's to us as well: 'If I'm going away, I will come again and receive you unto Myself; that where I am, there you may be also'. Promises about heaven and about the future that will sustain us through life's greatest troubles - that's why they're given to us, to get us through! Is that how we use them? As I've had the privilege of going through these Scriptures the last couple of weeks with you, I've just marvelled at our wonderful Lord and Saviour - particularly in this thought of how He is going to Calvary. This is the countdown, it's 'Holy Week', we might call it, coming to Good Friday. The Lord Jesus, most likely, is in the early hours of Thursday to Friday morning. It really is impressive that instead of the disciples lending support to Jesus in His hours before the cross, the Lord had to support them in their trouble - does that not blow your mind? Can I just remind you, was it two Sunday nights ago, they all walked past the basin at the door, and He takes off His garment, He girds Himself with a towel, He pours water into the basin and washes their feet of the dirt; then He dries their feet with a towel, and He sits down. We saw that as a picture of the cross, giving Himself completely to what He would do for them, and how He humbled Himself in service, how we ought to as well - but here He is doing the same, He's ministering to their needs. It's before Calvary, don't forget - though He's the Son of God - He's a human being; and yet, when He could have had His sensitivities so ministered to, He ministers to His own. I remember reading a little booklet a number of years ago, J.N. Darby gave an address on Luke 12:37, the verse that reads, the Lord is speaking: 'Blessed are those servants whom the master, when he comes, will find watching. Assuredly, I say to you that he will gird himself and have them sit down to eat, and will come and serve them'. That's a prophetic verse about when He comes again, and Darby called his address: 'The Lord Jesus, A Servant Forever'. This is what he says in it, one quote: 'I bring you to a place', Jesus says to His own, 'where you are to sit down, and it will be My delight to minister to you'. That is the heart of John 14 - isn't it wonderful? He's going to take us to glory to minister to us! But do you remember, we saw this morning, Jesus is the resurrection and the life, now. So He wants to minister to you in your trouble tonight. You don't have to give in to your emotion, perhaps like Peter, and despair. Of course in heaven He will forever banish our troubles, and He will minister to us in person - but you can have this now! Believers, I really feel an urge to re-emphasise this to you: you need to know this life now, 'Come unto Me, all you that labour and are heavy laden, and I will give you rest. The thief comes to steal, to kill, to destroy; but I am come that you might have life overflowing'. Is that what you're experiencing, believer? That is your blood-right in Christ - yet so few know the joy of their salvation. The human being has always longed for such a place as heaven. The concept of heaven is as old as man himself. Next to the idea of God, the idea of some sort of heaven is the greatest conception that has ever occurred to the human mind. The sense that we live forever somewhere has shaped every civilisation in human history. I'll give you a couple of examples: the Australian aborigines pictured heaven as a distant island beyond the western horizon. The early Fins thought it was an island in the faraway East. Mexicans, Peruvians and Polynesians believed that they went to the sun, or to the moon, after death. Native Americans believed that in the afterlife their spirits would hunt the spirits of buffalo. The 'Gilgamesh Epic' is a Babylonian legend, and it refers to a resting place of heroes, and even hints to a tree of life. In the pyramids of Egypt the embalmed bodies often had maps with them, placed beside them to guide them into the future world. The Romans believed that the righteous would picnic in the Elysian Fields while their horses grazed nearby. Very different ideas, I grant you, but there is a unifying testimony of human history that mankind believes in life after death. There is the odd rare breed of the atheist among them, but anthropology suggests that every culture has an innate sense of the eternal: that this world is not all there is! You've got it as well, and even the atheist buries it in his great intellect, or suppresses it with a sinful lifestyle that he excuses by his philosophy - but Scripture clearly testifies, Ecclesiastes 3:11: 'God has set', or planted, 'eternity in the human heart'. So heaven is not wishful thinking originating from us, but rather it is a hopeful anticipation that God has planted in us, Ecclesiastes says - not that we have designed heaven to meet our innate needs, but in fact God has designed us to need heaven. Are you with me? I don't know if you're a sceptic or not, but maybe you're sitting there tonight saying: 'I don't need heaven'. Well, ask yourself: where does the human longing for joy come from, the yearning for peace, the striving after perfection, the need to belong, the need to be loved, the quest for justice, and the search for satisfaction in all sorts of quarters? Where is that derived? C.S. Lewis said that since his childhood he had a longing for beauty, holiness, and eternal everlasting joy that, he said, was beyond all earthly satisfactions. He testified that whilst an atheist for some time, he decided that all these things - religion and so forth - were imaginary. But then he asked himself a question, listen to it carefully, he asked himself: 'Can one really have such an inherited and all-consuming longing for something that does not exist?'. Then he says he realised that all his old experiences of joy had been pointers, reminding him that he was made for another world. He then reinterpreted all those longings for joy as, in fact, longings for heaven and for God for ultimate meaning. This is what he said: 'There have been times when I think we do not desire heaven; but more often I find myself wondering whether, in our heart of hearts, we desire anything else'. What he is saying is: our search after meaning, our search after satisfaction - incidentally, in all the wrong places - is in fact something that God has built into us, He has set eternity in our hearts to have this longing for something more than ourselves and our lot. It is a longing for heaven and for God. The sceptic will say: 'Ah, it's escapism' - is it? Is it escapist for an unborn baby to reach for birth? Is it escapist for a shipwrecked sailor on a raft to dream of land? Is it escapist for a seed too long to be a flower, a caterpillar to be a butterfly, a prisoner to dream of release? No, it's not escapist, it's real! It's what you long for when you know that there is something that exists beyond your predicament - you're not there, but you long for that experience. It is real, it's not escapist! Because it is real and God has put it in our heart, it is in fact escapist not to believe in heaven. C.S. Lewis sums it up by saying this, remarkable statement: 'No philosophical theory which I have yet come across is a radical improvement on the words of Genesis, that 'In the beginning God made Heaven and Earth''. Someone will say: 'Well, you can't know for sure, can you? I mean, it's a nice anticipation, it's a bit of a spiritual placebo that might have an effect on you and make you feel a little bit better - but you can't know for sure'. The common quip is: 'No one has ever come back to tell us, have they?'. Well, better than someone coming back to tell us, Someone has come from heaven to dwell with us, Jesus. That's what the Gospels are all about, and in fact in this, John's Gospel, it's said of Jesus: 'He who came down from heaven', chapter 3 verse 13. John fills his gospel with many signs that attest to His heavenly identity, that He is the Son of God come in flesh - and, just before His return to heaven via the cross, and the empty tomb, and His resurrection, Jesus says: 'I am going away, and I'm coming again; and if it were not so I would have told you'. Manys-a-time I've preached that statement around an open grave, and I often paraphrase it like this: 'If it were not the case, I would have been the first to tell you' - that's what Jesus is saying. If there's no heaven, if there's no hell, if there is no afterlife, if there is no resurrection, if death is all there is - you die like a dog and you're done for - I would have been the first one to tell you that it was not so! Now, your issue is: is He to be believed? Is He telling the truth? Is He a deceiver, Jesus? Or is He deceived Himself? Now, if He were either deceiving or deceived, He died for the lie - and in fact His apostles followed suit, and thousands of Christians have died for this lie, believing that death was not the end. Rather all the evidence points to what Jesus said in verse 6 of chapter 14: He is the truth. He doesn't just speak the truth, He is the truth. All you have to do is weigh up not only Christ's words, but His ways, His life, everything He did - the proof is overwhelming that He is the truth, and the truth is: He died for our sins. Those indiscretions morally; those transgressions crossing the line of God's law and standard that He has given us enshrined in the Ten Commandments, that prove that we have fallen short of the mark of God; those things that actually bar us from the presence of the Holy God of heaven, and exclude us from heaven, and would doom us to hell - those are the sins that He went to the cross for, and He bore in His own body that we might be reconciled to God. He buried them in the tomb, and He rose again from the grave, and He is the only One who can save us. He is the only way to God, and that's why He says in verse 6: 'I am the way, the truth, and the life. No one can come to the Father but by Me'. That blows out of the water political correctness, doesn't it? Religious multiculturalism, that we have to say every road leads to God, and all gods are the same and all religions are the same - plainly either Jesus is wrong, or our society is wrong, and I know who to believe: the Lord Jesus Christ, the One who proved He was the way, the truth, and the life. You can't have a middle ground here, you've got to stand with Christ or stand against Him. He doesn't simply stand there teaching about the way, and He's not even pointing to the way, He is the way! Because the Apostles saw this, and came to God through Him, they died for this, the martyrs died for this, the saints died and fell asleep in Jesus believing this - that death is not the end, and those who have repented of their sins and believed in this Jesus, crucified and risen, shall never die! The great evangelical question is: do you believe this? Do you believe this? It requires an answer - what is your answer? This sounds like a real contradiction, but: believer, do you believe this? Some of us are practical atheists when it comes to these things. We have given a mental assent, but it hasn't fallen down that journey of a number of inches to our heart and affected our lives? You see, this is the problem: our lives are not being changed, permeated by these truths. Do you know the connection of the thoughts, and the emotions, and the will - that's the soul, essentially. The way we think affects the way we feel. If you've got problems with emotions, you need to start redirecting your thoughts - like Philippians 4 - and think good things rather than bad things, and stop feeding your head with negativity and sin perhaps, and this worldview, and the system that we see pumped at us via the media on a daily basis. You've got to stop it! Stop it! Feed your mind with truth, and it'll not be long until your heart changes, and your emotions transform, and then your actions start to change - because your emotions drive you to do what you do, so what you believe affects the way you behave. Paul's epistles are all about that: the first couple of chapters, belief, doctrine; last chapters, behaviour. Get the truth right, and your emotions will be right, and your actions will get right. How do we get into heaven if sin can't get in and we are sinners? How do we get into heaven if sin can't get in and we are sinners? Because Jesus is the Saviour of sinners, who cleanses sinners of sin and makes us fit to go to heaven. You see, you can't cleanse yourself of sin. Religion will tell you that: 'Clean yourself up, and maybe Peter will say at the gate' - and he's not even at the gate - 'maybe he will say, 'OK, you're clean enough, come in'' - that's not the way it works, it cannot work that way! The only One who would be worthy to be let in on that basis is Jesus, because He's the only perfect One. But what He has done on the cross, there has been a transfer where He has taken our sin, so that we might have, by faith, His righteousness. So if you come to Him tonight, confessing that you're a sinner, and repenting of your sins - changing your mind about your sins - He will give you God's righteousness that will allow you to enter heaven, because it's a holy place! But Father's house is also a happy place - it's not just a house, it's a home. You might be living tonight in a house that isn't a home. Many of our houses are filled with bad memories, but in this home there are only good memories. There are no tears. It's a home that is beautiful beyond description, and better: it's permanent. Are you a young person here tonight, and you grew up in a nuclear family, and all of a sudden - for reasons unknown to you, or at least the depth of them - something happened and wrenched Mum and Dad from each other, and you've grown up between two houses, in the brokenness of a marriage? It has affected you with disappointment, it's not what you would have wanted, it's not what you're Mum and Dad would have wanted I'm sure, but this home is different: Father is never going to desert you, the home is not going to be broken up. Maybe you have lost a loved one - if they're in Christ, they will be there, what a wonderful thought of reunion! But the greatest thing about Father's house is - and this is what Jesus said to His disciples - 'I will be there, so that where I am there you may be also'. So the entire focus of heaven is being reunited with Jesus. Heaven is heaven not because of the streets of gold, or the pearly gates, or even the presence of angels, heaven is heaven because Jesus is there! I remember hearing of a little black boy on the mission field who was dying, and he spoke of his desire to go to heaven to be with Jesus - it must have been to another missionary, who hadn't much sense it would have to be said. This adult missionary said to the young lad: 'But what if Jesus were to leave heaven, what would you do?'. The wee fellow said: 'I'll follow Him'. Then the missionary went on: 'But suppose He went to hell, what would you do then?'. At once the little lad, with an intelligent look and a smile, replied: 'Master, there is no hell where Jesus is' - there isn't, in life or in death. Maybe you feel like you're going through hell now - do you know what I read in the Daily Mail? I know you can't believe everything, but Arsene Wenger said that the last couple of months that he experienced as the Arsenal manager makes hell, going to hell, his going to hell a breeze. That's an awful statement. Do you know the deliverance of Jesus coming into your proverbial, metaphoric hell - whatever you're going through now? My friend, can I ask you: do you know the deliverance of Jesus coming into your proverbial, metaphoric hell - whatever you're going through now? Do you know the certainty of what it is for Him literally to save you from the prospect of a future judgement, which He took upon Himself so that you wouldn't have to? That's the wonderful good news! What a cure for the troubles of life and death: to know who God is, and His heart by Jesus revealing Him in His love for us, dying for our sins, rising again, so that we might rise again, so that we might have eternal life within us now as a present personal possession, and one day the promise of going to be with Him in heaven - whether He comes to resurrect us, or whether we die and we go to be with Him - such a hope will get you through life and through death! In 1952 young Florence Chadwick stepped into the waters of the Pacific Ocean off Catalina Island. She was determined to swim to the shore of mainland California. Now she had already been the first woman to swim the English Channel both ways. The weather was foggy and chilly, and she could hardly see the boats that were accompanying her on the swim. Still she swam for 15 hours, and when she begged to be taken out of the water along the way, her mother who was in one of the boats alongside told her that he was close to the land, and that she could definitely make it if she just kept going. Finally, physically and emotionally exhausted, she stopped swimming and was pulled out. It wasn't until she was on the boat that she discovered the shore was less than half a mile away. At the news conference the next day, she said - listen to these words: 'All I could see was the fog. I think if I could have seen the shore, I would have made it'. All I could see was the fog, but I think if I could have seen the shore, I could have made it - do you see the shore? Do you see heaven? Do you see the hope and certainty of your sins forgiven, and being with God when you die and when Jesus comes again? For that will get you through life, that will get you through death, that is the cure for care. Jesus said: 'In My Father's house are many mansions', many dwelling places, many abodes - do you know what He meant by that? Listen: there's room for all, and a place for each. Have you booked your place? 'Believe in God', Jesus says, 'but believe also in Me'. Do you believe this? For if you do it will change your life presently, and forever. Let us pray. Now let's just take the moment, while God's Spirit is brooding over this gathering. Someone was talking to me about the need to linger, just when God shows at meetings. You know, I feel that we as God's people really need to be taught about God's presence. We don't even recognise His presence at times, let alone know how to preserve it. You see the stillness that is around having received the word of God, you see the heaviness and density. We need to reverence that, and realise that God is interacting with people. We need to allow ourselves time to wait in His presence - what is He saying to you? Is it your time tonight to believe and receive salvation? Someone here, a young person - maybe I have touched upon things in your life, raw spots that you need healing and deliverance for, you need the cure for your care - it's the Lord Jesus. This is a full salvation that He offers, it's not just wiping the slate clean for wrong things that you've done, and giving you a ticket to heaven - He wants to make you whole, He wants to restore what sin has done to you. He said: 'The Spirit of God has anointed Me to preach good tidings to the poor, to heal the brokenhearted, to set at liberty captives, to give sight to the blind, to open the prisons for those who are bound' - that's His mission statement, is that what you've experienced? Experience it tonight, say: 'Lord Jesus, yes, I'm a sinner! Lord, I come to You with my sin, and I come to You with my baggage, and I come to You with my hurts, and with my past, and with all that I am. I just surrender myself'. Maybe there is a believer who needs to do this tonight? 'I just surrender myself to You, Lord, and say come in and just start to sort me out, save me, and take me, and make me whole'. Father, I pray that Your word will not be lost on us. I pray that lives will be changed and transformed forever by the power of Your word and the Spirit. Lord, hear our prayer, thanking You that You can say tonight to maybe those who have let You down, and betrayed You, or denied You, or just worried about their present, or their future, or guilty about their past - may they hear the word of Jesus to them tonight: 'Let not your heart be troubled, believe in Me'. We could have read on tonight, Lord, to that wonderful verse: 'My peace I leave with you, My peace I give unto you. Not as the world gives, give I unto you. Let not your hearts be troubled, neither let them be afraid'. Lord, may people take this to their hearts tonight, for the glory of the Lord Jesus we pray, Amen. This sermon was delivered at Scrabo Hall in Newtownards, Northern Ireland, by David Legge. It was transcribed from the eighth recording in his 'Portions From John' series, entitled "The Cure For Care" - Transcribed by Andrew Watkins, Preach The Word.